Maurice White performing in 1982, with Earth, Wind, and Fire at the Ahoy Rotterdam, The Netherlands. 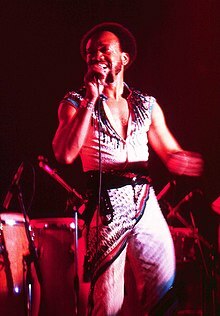 Maurice White (December 19, 1941 – February 4, 2016) was an American singer-songwriter, musician, record producer, arranger and bandleader. He is the founder of the band Earth, Wind & Fire. He is also the older brother of current Earth, Wind & Fire member Verdine White, and former member Fred White. His career began in 1961. He retired in 2014 due to his health. White was born in Memphis, Tennessee. He was raised in Memphis and in Chicago, Illinois. White served as the band's main songwriter and record producer, and was co-lead singer (along with Philip Bailey). White has won seven Grammys, and was nominated for 21 Grammys in total. White died in his sleep on February 4, 2016 from complications of Parkinson's disease. He died at his home in Los Angeles. He was aged 74. ↑ "The Official Earth, Wind & Fire Website". Earthwindandfire.com. Retrieved October 31, 2011. ↑ "Maurice White Overview". allmusic.com. ↑ "Awards Database – Maurice White". Los Angeles Times. ↑ "Maurice White, Earth, Wind and Fire co-founder, Dies at 74". MyFox8.com. Retrieved February 4, 2016. This page was last changed on 10 November 2017, at 00:32.